... a sort of insalata di mare, but as a full salad. Lunch. While browsing at the supermarket, I found a jar of "Seafood" in oil. Upon draining, it turned out to be squid pieces, octopus pieces, the odd mussel here and there and a few other bits like prawns. The salad base was cos lettuce and pea shoots, peppers chopped on top, some leftover guac in the middle, seafood all around, black pepper, tomato to cut through the oiliness, boiled egg on top, garnished with shredded spring onion and a gentle slosh of olive oil over. Slice, fry off in a skillet in butter with some paprika and the enoki mushrooms. Steam the cabbage, then combine with the mashed potato and fry off in a skillet in butter. Bubble & Squeak down first, chicken and mushroom over. Egg on top. Pea shoots as garnish. Dinner done! It was champion! The vernal equinox is upon us, but we don't need all that clever science to tell us that spring is upon us! The weather is getting milder, the days feel longer, all manner of new things are growing and there's hope in the air ... hope for the new year and a bountiful one to come. Wild garlic is the one natural phenomena that tells me spring is upon us. Walking through the hills, valleys and woods, suddenly in the still a single aroma permeates through everything ... garlic! 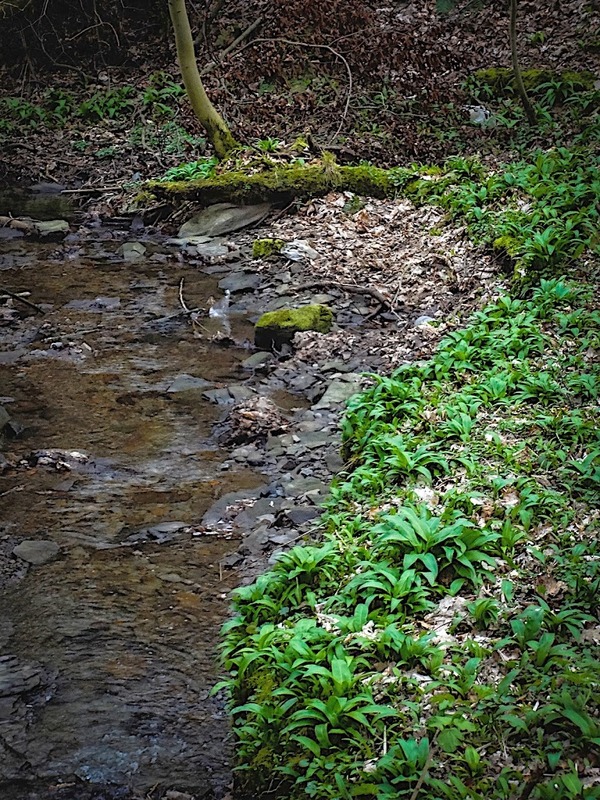 It is truly magical when that moment happens and upon looking round, there it is ... all around ... wild garlic! I've been writing this blog for three years now. Three years since taking up a paleo diet, for the reset, and then maintaining an ancestral approach to nutrition. I have shunned "science" largely since I don't believe it - every time science comes up with something, it will disprove itself in a few years; no, what I follow is a natural sense of order. If we've been doing the same thing for 2.5 million years then it's pretty certain that is the right thing to do. Changes to that which have come about in the last 25 years, 100 years, 2,000 years, 10,000 years, well, there is good to be taken from it, but largely those changes stand to re-affirm that what we've been doing for 2.5 million years of existence is largely right. Where it is not right is almost certainly down to us not being in accordance with our evolutionary past. Nutrition is one third of an almost holy trinity of work, play and replenish. Work is good. What we work at nowadays has its drawbacks and those of us who sit in an office for a third of the day might well look at folks who do manual work and feel jealous, and it is a sad fact that renumeration is often inversely proportionate to the action amount of use, or good, that a person's labour produces. That said, work is good ... dive in, do what you do well, put all your efforts into it, enjoy it, ensure those who you encounter, deal with, make deals for, undertake activity on behalf of, all those people - ensure that all those people enjoy your efforts. Delight them! Savour it and never get sour about who might be benefitting from what it is that you're putting in - you're winning! You win by living life well, working hard, playing hard and replenishing. Play is good, and I will include rest in here, too. We've worked, we've worked hard and given it everything. Now play! Go out for a walk with your partner, your family, take the dog, take the cat if you can slip a lead onto it. Take a bottle, take a little food, enjoy a sit down, look at the views, watch the skies, watch the sun set. Play, be restful in your play, be competitive in your play, be collaborative in your play. Replenish. This also includes sleep. Nutrition is largely what this blog is about, but sleep is so important especially to combat the ills of modern life. Make your bedroom your cave - remove all technology and place an alarm clock just outside the bedroom so that you're not intruded upon by time, but can still wake, rise and get up when you need to. Blackout curtains, sound-proofing, peace and quite; all paramount. I've written this blog for three years ... I said that, already. In that time I have seen "paleo" change, first on fats, then on dairy, then on starches, then on legumes, and you might be wondering what's left of "paleo" if we now enjoy saturated fats, fatty meats, good dairy, simple starches like potato and rice, even properly prepared legumes; what's left? Well, everything, actually. Paleo is about so much more than simple nutrition - your lifestyle, your approach, your mindset, work, play and replenishment timing, and that's something I've been playing with for a while and have come up with what works for me: close to the Renegade Diet, certainly close to 'Eat Like a Predator' and very much akin to Cordain's musings on food timing. Eat in the evening. Eat well, eat to fullness, perhaps overeat, perhaps not. Eat protein, fat and carbohydrate. Whenever you finish eating, give is a 16 hour break until you eat again. In our hunter/gatherer past, the day was spent collecting and hunting for the evening feast. Leftovers, if any, might have been nibbled at in the morning, but for the most part "breakfast" would not come until later in the day when crossing a stream and spearing a fish to eat or grabbing a handful of wild berries. You get my drift. So, come lunchtime, noon, maybe one o'clock, that is the time to break the fast and eat something simple - protein, a fish, a piece of chicken, an egg, perhaps some cottage cheese or some yoghurt and berries. Then comes the feast in the evening. This is working well for me and working well for my wife, although she likes a mid-morning "breakfast" of good, natural yoghurt and berries, lunch around one o'clock. I've written this blog for three years ... I'm sure I've said that, already. I don't do things traditionally, in fact I do, but that is a point of semantics. I don't "do" recipes. I don't do recipes for a reason and yes, it frustrates, but the whole point is, learn. Learn to cook, learn to know seasonality, learn to find the best reared or grown food, learn how they fit together, experiment, try new things, most of all don't follow recipes. Recipes constrain. "Take gode broth and do in an erthen pot, take flour of payndemayn and make therof past with water. and make therof thynne foyles as paper with a roller, drye it harde and seeth it in broth take Chese ruayn grated and lay it in disshes with powdour douce. and lay theron loseyns isode as hoole as thou mizt and above powdour and chese, and so twyse or thryse, & serue it forth." No table of ingredients, no dictated and numbered method, just a description of the food and how to put it together. Sound familiar? Why, thank you! Yes, you spotted it - just like I write. I do this for the single reason that I don't want to constrain you to my list of availabilities, skills and equipment. I set out what I did and hope to inspire. From here, I think I'll probably do things a little different and just post up what it is I'm eating. I might add some dialogue, but don't expect recipes and method. Don't expect them because they are not useful; useful is learning how to cook instinctively, inspirationally and enjoying the hell out of what it is you've cooked. Recipes are a construct of modern cooking and are anathema to ancestral eating. Recipes exist because modern food and modern cooking is so uniform ... and mundane. Imagine writing "175C for three hours" in 'The Forme of Cury' for Cooks who were cooking on open fires in ovens that had no standard whatsoever. It would not make sense and does not make sense for the ancestral Cook. I capitalise Cook, since it is a proper noun - use it and never be ashamed. Chefs train for years in tradition; Cooks know instinctively what to do with leftovers. The ancestral Cook knows that some protein and some vegetables make a meal. It does not get more complicated than that and there are three key cooking methods that the ancestral Cook needs to know about: frying, steaming and stewing. Steam veggies, steam fish. Fry meat, fry fish, fry organs, fry some veggies. Stew meat and organs. That is all you need to know, but what you need to learn is which of each is best with each of those cooking methods, all of which are possible over an open fire outside. If a caveman could do it, surely we can, and that is why I reject recipe ingredient and method dogma, giving only "here's what I cooked and what I threw in with it", sometimes why. I've written this blog for three years and I will carry on writing it - this is my blog, my adventure, my food, my life. As the years roll by and the seasons push through, you'll see some familiar food coming through, but that is the point - the wheel of life pushes ever on and in that comes repetition; repetition because of seasonality and availability. Embrace it and love it! I will certainly come up with new ideas, fresh inspiration and take time to set that out here at 'Living in the Ice Age'. Spring is upon us, the new year has dawned. Have another great year, folks. I do hope to hear from you, so don't be shy and drop your thoughts, ideas and comments into the form at the bottom of every post I make. Work, play and replenish, folks. Chimichurri is an Argentine sauce of chopped parsley, minced garlic, olive oil and vinegar. In its simplest form, that's about it but additions of chilli, other herbs, even cumin are not unheard of. Chop some parsley, minced some garlic, de-seed and mince a chilli, add olive oil, cider vinegar, sea salt and black pepper, and you're done. I also added in some shredded spring onions. Pollock, for me, simply fried in butter for about three minutes each side and served with the Chimichurri. Potato wedges, par-boiled and fried off in goose fat. Gorgeous! I think I have a new favourite for Fish & Chips or Steak & Chips. I've had it in mind to try home soaked beans for a while. After doing some reading, I settled on black beans, soaked 'em and boiled 'em. Intending them for later as refried beans with something Mexican on Friday, I settled them into the fridge ... but ... ended up using them as part of dinner this evening instead. We were tired and wanted something quick, easy, tasty and slightly celebratory for St Patrick's Day and so, a pack of lamb and mint chipolatas came to the rescue as the core of the meal, these beans and some leftover wild garlic mashed potato with boiled savoy cabbage alongside. Is it Irish? Not much, but I tipped my hat to them ... and my Guinness into the beans. I guess Lamb & Colcannon is a good enough nod and wink. Into the oven at 180C for about half an hour. Soak for 24 hours, changing the water once. One cup of beans to three cups of water. Once soaked and drained, boil for about an hour again in lots of water. You can eat them at this point, or put them in the fridge for re-heating within a day or two. I re-heated in pan along with a splash of Guinness (okay, half a pint), Worcestershire Sauce, some enoki mushrooms, a finely chopped chilli, half a finely chopped onion, black pepper and sea salt. Cook on the hob for maybe 20 minutes to reduce the liquid and really soften the beans. Simply combine mashed potato and boiled or steamed cabbage. I had some leftover mashed potato and steamed some savoy cabbage to add to the party. Combine in a skillet with a little butter. After about half an hour, we're good to serve ... beans down, sausages over, colcannon alongside. Very tasty! Very tasty indeed and certainly a "do again". I see beans, properly prepared, as useful in an ancestral diet, but a starvation food nevertheless. While meat, fish, shellfish, eggs and vegetables exist, why eat off the plate? Well, our ancestors did, so this in an ode to them. Black beans are very nutritious and beneficial for digestive tract health, cardiovascular strength and blood sugar regulation. You can read all about them with a simple search on the internet, but perhaps qualify your search with the terms "paleo" and/or "resistant starch" alongside. Soaked and boiled, perhaps chilled and re-heated, the health benefits do appear to dramatically outweigh any potential negative, and I say potential since the unhealthy phytochemicals are largely removed or neutered in the soaking and boiling. Bloating? Gas? Wind? I'm happy to report none of the above. Rice Pudding? Is it paleo? Is it primal? Is it ancestral? You cook a great stew, cook up some starch to go with it - rice for me, mashed potato for Mrs and you end up with some rice left over. Well, you could chill it, which I gather increases the resistant starch element ... best hop over to Free the Animal for the skinny on that one; or, you could make up a quick pudding. Simply pour in some double cream, a sprinkle of cinnamon and reduce to a thick, sticky pudding. If you really can't eat this without sweetener, add whatever it is you do - palm sugar ain't so bad. What do you do with trimmings? Throwing away trimmings brings me out in a cold sweat! I abhor waste. I tend to make soup, for which I just bung everything in along with onion, garlic, potato and bouillon then blend it. Reducing further can provide a highly concentrated amuse bouche, let out with a little cream and you've got a seriously good soup. I'm not at all au fait with Asian cuisine other than Kashmiri, Punjabi and Pakistani. I'm intending to make one of those spicy and sour soups I read about using cauliflower stalk trimmings, some tenderstem broccoli stalks and a couple of straggling stringless beans. I picked up some crayfish yesterday, which I think will work well in this soup. In they go! Garnish with fresh coriander and a drop or two of walnut oil. Gorgeous! What a great soup! I have some tuna which is the star of the show for dinner tonight. I always struggle with tuna, trying to think up a whole and rounded meal to make around it; to me, tuna is perfect with a simple spicy, fruity accompaniment. Hence the more filling soup course. Seared tuna, persimmon slices, some lamb's lettuce, red chard and chilli. Garnish with fresh coriander and a squeeze of lime. And, there we have it: a dinner of two parts, the star of the show glorified by simple accompaniment and the introduction, a flavoursome cornucopia of trimmings and things to use up. Lightly smoked salmon fillets are absolutely gorgeous and can work so well with a simple dill sauce and vegetables, or take on stronger, spicier flavours. I made up a stir-fry of asparagus, tenderstem broccoli, leek, garlic, ginger and a slice of pork I had left, to go with some rice noodles and an impromptu sauce from Maggi Chilli Sauce, Worcestershire Sauce, yuzu, rice wine vinegar and mirin. Yes, one of those pour everything in and stir kind of sauces. Make up a sauce, stir-fry some veg, pan-fry your salmon and pour boiling water over some noodles. Put it all together and sprinkle some seeds over. Eat and enjoy. Fish in the style of Veracruz. Highly colourful, seriously flavoursome and everything you'd expect from Mexican cuisine. Perfect for pepping up a bland piece of North Atlantic pollock. Upon reading an ingredient list for Veracruz Sauce, you would not be the first person to double-take and think you were reading the recipe for a Mediterranean dish, but when you consider the influence of the Spanish upon the people of Veracruz, the penny drops. Tomato as the base, onion, garlic, fennel, chillies, capers, olives, sea salt, black pepper and some parsley. That was my sauce, started with some red palm oil, the onion, fennel and garlic softened and in with some chopped tomatoes, followed by de-seeded and shredded chillies, capers, olives, sea salt and black pepper. Upon tasting, it was a little mild so I popped in a little naga jolokia paste! Now it demands your attention! Phew!!! White fish, part of the cod family. Fished now as an alternative to cod, it's cheap, it fries, it bakes, it steams, it's versatile and simply put a damn good piece of fish. You might have noticed that the more common oregano and marjoram do not feature in my sauce recipe? Well, I'm going to dust the fish with dried herbs: marjoram. When you're ready to eat, simply fry these off in some of your favourite paleo fat - yes, goose fat for me. Three minutes each side will do admirably. Great on its own, but it's Friday night and we want a feast! Take a sweet potato, wash it, cut into wedges and pop them into the oven for about half an hour in a little of your favourite paleo fat. Turn a couple of times during cooking. Serve out with the wedges in the middle, spooning some of the sauce onto each plate, laying a piece of fish on and more sauce over. I finished the dish with some diced Sharon Fruit. Open Piccalilli? Yes, you know ... de-constructed, like. Piccalilli is an Anglicisation on Indian pickles, tracing back to the middle of the eighteenth century. Simple, pickled vegetables, mustard and chilli; vegetables brightly coloured with spices such as turmeric. Put the lot together in a bowl with some cider vinegar, English mustard and sea salt. Stir a few times over a couple of hours before serving. Simply skin and pan-fry in your favourite paleo fat - I used salted butter. Don't over-cook it! Just three minutes each side is fine. Serve out, fish first over some salad leaves, piccalilii over the top. We also had some leftover Gratin Dauphinoise, re-heated. The cold pickled worked so well with the fish, spicy and fresh spikes of flavour softened by the warm flesh. Shrove Tuesday ... Pancake Day! Simplify some manioc tortilla using half a cup of the flour, two eggs, quarter cup of grated pecorino and a touch of melted butter. Four 6" pancakes. Turkey mince, prawns and steamed cauliflower flavoured with ground coriander, black pepper and chillies. Brown off the mince, add in some prawns, steam the cauliflower, crush and combine with the meat. Add flavours, you're done. I also put in a few stalks of asparagus. Cheddar, double cream and English mustard. Melt, let out with a little cream and add a touch of mustard for a gentle bite. That's all. Traditional French, from the Dauphiné region, a rustic dish of potato, garlic and crème fraîche. Rustic is the key here because like much French cuisine, this has been elevated to the ridiculous in terms of technique and ingredients. Peel and slice the potatoes. If you have a mandolin slicer, great, otherwise use your vegetable peeler or a good kitchen knife. Slice into your cooking bowl so that you have the quantity to use and keep going until the cooking receptacle is maybe three quarters full. Like all ancestral cooking, we're not limiting ourselves to this one meal - leftovers are great! Make a big batch and enjoy the rest re-heated. With sufficient potatoes, we can now add the rest of the ingredients. ... and so, onto the cream. Using double cream or crème fraîche, pour in enough to coat the potatoes as you mix them into the cream with your hands. Use a little to start with - you can always add more. Pat the potatoes down to make a flat cake and dot some butter over which will crisp up the top and giev a lovely flavour and texture to the dish. Into the oven set to 175C (350F?) for an hour, or so. An hour is good for maybe an inch and a half thick and thinly sliced potatoes. You'll want longer and perhaps a lower temperature if yours is deeper or thicker slices. We finished off a corned beef and vegetable stew and had some turkey sausages on top, and we'll have the leftovers later in the week with some haddock, pickled vegetables and chimichurri.